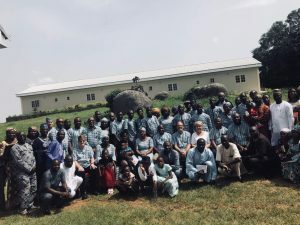 Editor’s Note: This is a wonderful reflection and update from Jon and Francie Byron about their recent trip to Nigeria. Jon is one of the founders of The Leadership Institute and both he and Francie continue to lead us well as treasured friends. What a wonder it has been to travel across the seas to the far off land of Nigeria and experience the grace and faithfulness of the Lord. Francie and I just returned from Africa having spent a week with those going through the spiritually based leadership process called the Journey. We were there to bring encouragement from the fellow Journey participants in the U.S.A, join in the presentation of content, be a further resource to their development and most of all to celebrate all that the Lord was accomplishing in their lives. We had the privilege to watch nineteen participants graduate from the process as well as to be blessed by the presence of a large group of alumni and current participants. One highlight was the way those from Nigeria encouraged and poured into us. What a gracious reception we had from those who were participating in the Journey retreat. We found their commitment to Jesus and desire to extend His kingdom inspiring. They came from various regions of the country, some at great sacrifice, and throughout the time continued to encourage us with stories of transformation. We met pastors, professors, doctors, government representatives and spouses all desiring to learn godly leadership process. It was a delightful experience. Francie taught a group of woman a Bible study tool designed by Chuck Miller called 2PROAPT and led one of the Journey cohorts in a special experience using some pictures of bridges as an opportunity to reflect on the Lord’s work in and around them. And I was so blessed to be able to teach at three of the sessions, share a few songs and lead at various moments in worship. One special moment came when I taught them a song I had written from Psalm 46:10 called “Be Still”. They were so quick to pick up the song and lift their voices in praise to the Lord. It is a great privilege to engage with others in these far off places because it reminds me of the expansive reach of God’s kingdom and His continuing work of restoration and transformation He is accomplishing. It also reminds me of my need for all the various parts of Christ’s body and how small my perspective is. I was truly humbled as I experienced the generous followers and servants of Christ the King in Nigeria. Too often I live in the comfortable cocoon of my preferred experiences and can easily become a little complacent. Traveling into Nigeria reminded me to be very grateful for where the Lord has me, and also grateful for the ways He is at work in other places and how that can enhance my experience with Him. It was an honor to join these Nigerian believers and their leaders in proclaiming the glory of the Lord. To all of you who made this trip possible through your prayers and financial donations I want to say thank you for your generous support. We are so grateful for this opportunity and for all that the Lord did in us and through us during the trip. We also know that He has more for us to reflect upon and learn from the experience. I pray that you will be encouraged with us at the work God continues to do throughout the world and the role the Leadership Institute, the Journey and Press Pause Ministries plays in joining Him in this work. Thanks again, and may the Lord continue to bless you with a rich awareness of His generous love, grace and peace as you continue to journey with Jesus.